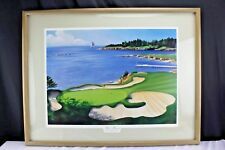 Arthur Weaver " Pine Valley Golf Club Tenth Hole" Print 1994. Numbered 317 of 1000 Signed by Arthur Weaver. Complete item frame included measures roughly 27 3/4" wide and 20 1/2" tall. Very nice Pine Valley Golf Club USA piece. Unique and interesting. Good conversation piece. Please see the photos and ask any questions you have! Thank you! W 30 5/8" x H 24 5/8". 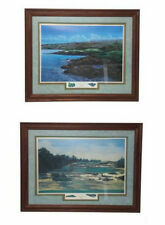 1998--R. Baxter "Life Is Short,Play 18" & Golf Green By Ocean 22" x 18"
(2)1998--R. Baxter "Life Is Short,Play 18" & Golf Green By the Ocean Print_Matted & Framed--22" x 18"
Print: Trap Shot by Robert Harnett. Details: Beautiful Golf Print from 1993. About the print: The chimp shot is a play on words from the heart and soul of golf country. Even so, I was careful to create the pose and intensity of many of the real duffers I've seen planning chimp shots.Will Bullas. 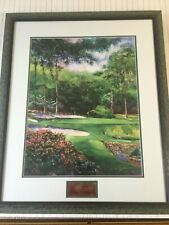 Ken Call "13th at Augusta" Watercolor Limited Print, Signed, Framed, 18" x 23"
This seems to be out of the normal type of paintings she is known for. She does alot of religious pieces and ballet dancers from what I have seen. Pebble Beach golf course in California the 4th hole with a nice sail boat on the horizon. "North Berwick" Hand Pulled Lithograph (46"x36") by the RE Society, Image Orig. by Andrew Johnson with Certificate of Authenticity. "North Berwick" is a hand pulled lithograph on paper by the RE Society, image originally by Leon Dupin. 245/980 LIMITED EDITION KEN CALL 12TH AT AGUSTA GOLF COURSE. The artist, Ray Byram, describes how these hand made prints are created The image size is 24" X 36" plus full margins. The edition size is 297 plus Artist's Proofs. There is also an edition of 28 on canvas. 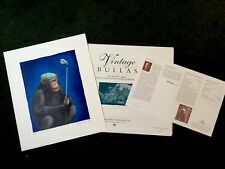 Victor Spahn Golf Art Ready to hang Framed Fine Art Lithograph LE Make An Offer! By Victor Spahn. Victor Spahn was born to Russian parents in Paris on March 20, 1949. His art interest began as he started working for a fabricator of mosaics, after which he created his first mosaic wall. Title: "OLD DUFFER". 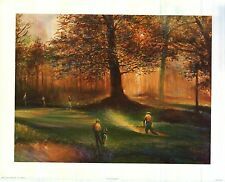 This is a LeRoy Neiman print of golf. In exceptional condition with no lines or creases. A great gift for any golf fan. Artist: LeRoy Neiman. Type: Print: Lithograph. Paper: Heavy gloss paper. Color offset lithograph printed in 1998. Printed on 100% pH neutral archival paper. Beautifully rendered image of Hogan, leaning on his club in a relaxed manner. The backdrop features a page of a 1953 newspaper with a headline on one of his historic victories and a beautiful golf course. It is 141 out of 850. It looks really nice and was created in 1998. By Larry Dyke. S# COA Edition of 95. s/o lithograph transferred to canvas by publisher. See pictures for details. Pictures taken with and without flash. BY ELIZABETH PEPER. We have PEBBLE BEACH Hole #7 and MAUNA KEA Hole #3. DREAM COURSE HOLE # 16 CYPRESS. 2786 OF 10000. LIMITED EDITION PRINT (1994). Received direct from the manufacturer in the 1990's. 14" x 11" prints on cardstock of George Murray's pencil drawings of three golf legends. Ready to hang in any golfers den or man cave. "Playing Through". Image Size 22" X 18.25". Print and mat are in perfect condition. The glass is chipped at the bottom and the from has a nick in the top right corner, both minor and both shown. Photos are of the actual print you will receive.